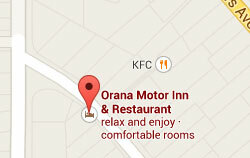 Orana Motor Inn Conference Room is in the middle of the complex, suitable for up to 30 people boardroom style or up to 50 people theatre style, with 2 options for an alternate room also. We are an ideal location for seminars, interviews, conferences, workshops and team building exercises. With the great staff we have here, you are sure to have a function that will be effective and memorable. Our Restaurant and Bar provide the full range of catering options. The combination of on-site facilities in close proximity to town and central to the Far North make Orana an ideal venue for your event. Contact us about putting a package together for you to suit your needs. We can combine catering, conference facilities and accommodation all in one package deal.